Need a cake for your Star Wars-obsessed BFF? Or a cute cake for a baby shower? Happy Belly Bakes can whip up every imaginable designer cake that’s both Insta-worthy and delish. One look at Happy Belly Bakes’ Instagram handle here, you can tell that the bakery can literally make anything you want out of a cake. While you are on their handle, you will see that cakes have a pop-culture angle to it which will leave all you Disney or Marvel enthusiasts craving for a cake of your own. And the more time you spent on the feed, you’d never believe that the detailed Frozen/superhero mash-up, a rainbow unicorn or even an English high tea situation are all made of just cake batter, colourful frostings and toppings, and sugary goodness. The bonus is that the patisserie also does eggless and gluten-free versions as well. You really need to spend some time on their feed to make up your mind. 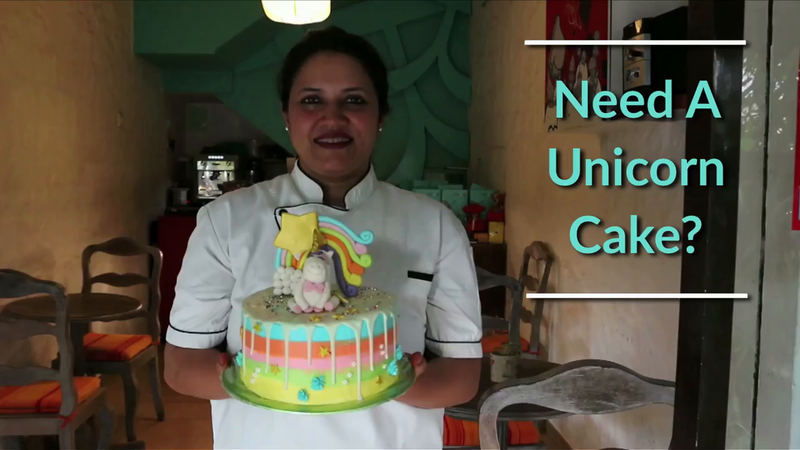 Our picks include the rainbow unicorn cake, a Madagascar one that has Alex the Lion’s face, and rather colourful and cute as hell cake featuring Princess Poppy, Branch, and other characters from the movie Trolls. Oh, and brave Jedis and Padawans, we spotted a Stormtrooper cake as well. Maybe order that when the eighth episode releases? Want to know what goes into your Star Wars-inspired cake? Well, for starters there’s the Chocolate Truffle and Chocolate Brownie Fudge cake bases that you can go for. These are favourites amongst the patrons followed by the Banana Walnut and Caramel Buttercream. Flavours are aplenty, including a vegan chocolate option as well. Now, we did mention that these guys can literally make anything out of a cake, so show up with a design or an idea, and get it baked. Toppings, fillings, and cake bases are according to your choice, and they even allow you to create your own combo of flavours — we are thinking a blueberry, red velvet, and chocolate truffle combo. A week in advance is a good time for placing your order but they can also work on a 3-day notice period as well. The starting price for these designer cakes are INR 1,800 and they do deliver around town for an extra charge depending on the location.